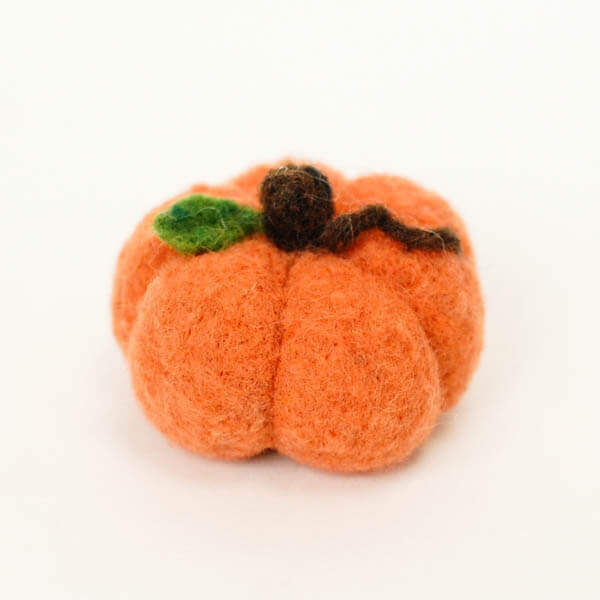 Since I’ve just introduced you to needle felting I thought a needle felted pumpkin would be the perfect project to share. So, are you ready to needle felt?! You first step will be to grab a handful of wool batt. Now just roll it in your hand into a loose ball and start gently poking it with your needle, turning as you work. 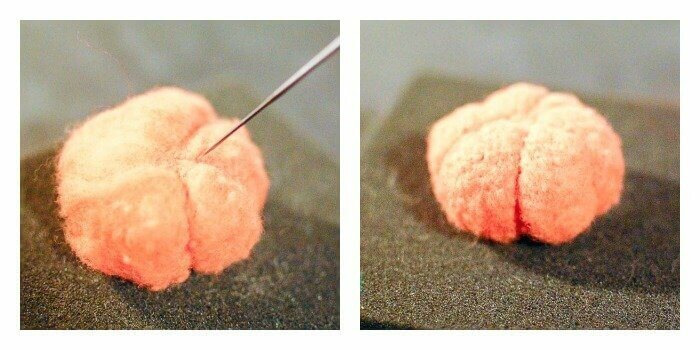 Keep felting until you have a nicely shaped ball, but not so tightly felted that it is becoming difficult to poke the needle into. 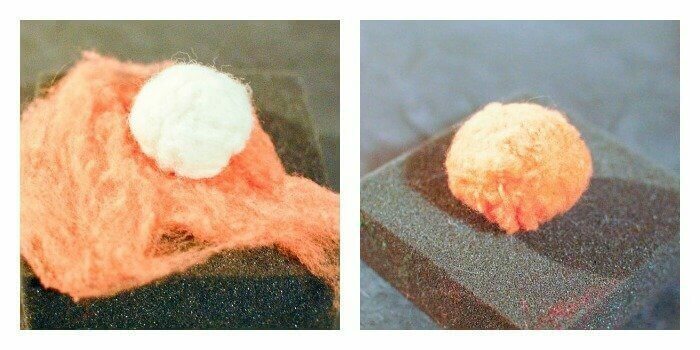 At this point, wrap some of your orange roving around the ball and use your needle to felt the orange around the ball. Now we are going to begin shaping our pumpkin. Use your needle to poke indents down the sides of your circle to resemble a pumpkin shape. If needed, you can use some additional wisps of orange roving to build out the side areas between your indents. Now that you have your pumpkin shape, the rest is just embellishing. Use small wisps of brown and green and shape them into a stem and leaf using your needle. Then use your needle and poke the stem and leaf into place on the top of your pumpkin. There is quite a bit of freedom to needle felting. You ca just keep poking away until you get the exact shape and design you like. 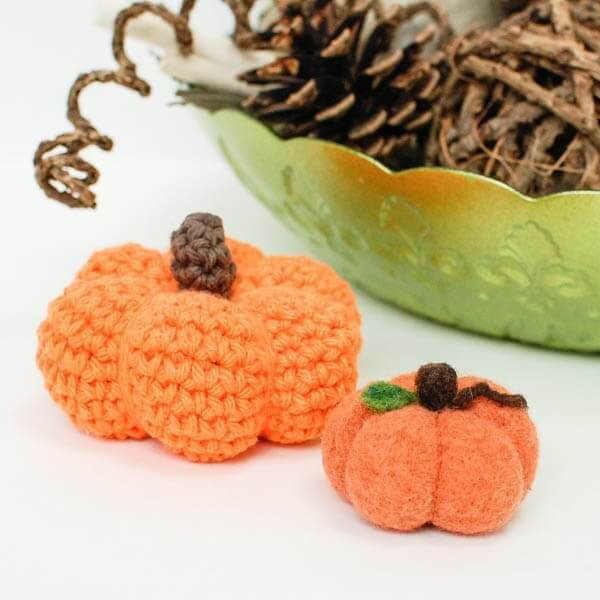 You can find the pattern for the little crochet pumpkin here. 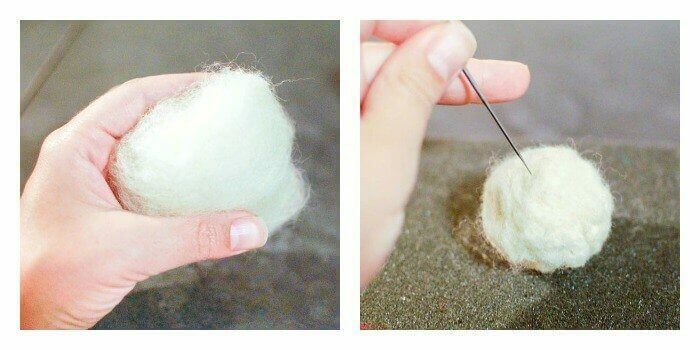 I know next to nothing about needle felting- what a great tutorial! You make it look so simple and do-able, as always! These little pumpkins turned out adorable! Do you know how many times I’ve walked past the wool felting at Michaels and stopped just to stare at the pretty colors? I’m so afraid to start another obsession, but this is just too ridiculously cute! Wow, Kara…you make needle-felting seem so do-able. And like something I might even try! I love the look of your plump little pumpkin. He’s darling! When we bought and moved into the home previously owned by my husband’s paternal grandparents, one of the things left behind was an old metal thimble. My daughter (10) did not know what it was. Eek, I thought, what kind of a crafty mama am I? So I would like to do this project with her, half because it’s so darn cute and part as a needlecraft history lesson! That sounds like a wonderful mother-daughter day to me!! That is seriously the cutest little pumpkin ever! What a cute pumpkin, I have always wanted to felt something, the look is so pretty! That is crazy-adorable, girl!!! SO cute! I need about 10 of those! So glad you like it, Amy! 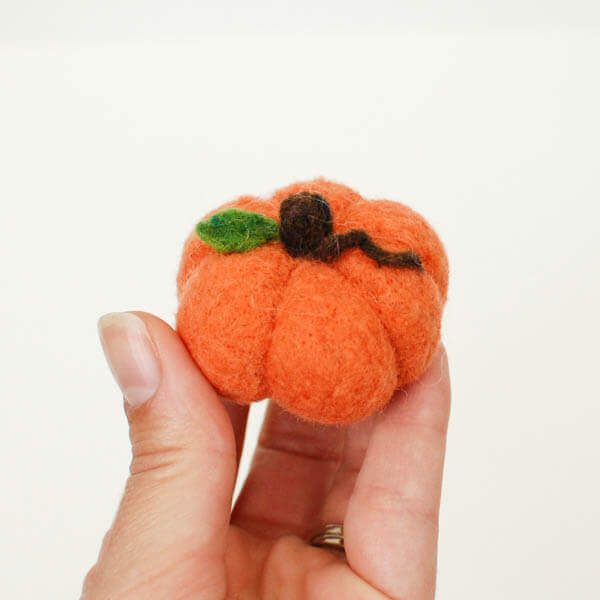 Love your needle felted pumpkin ! Adorable !